Participants take off from the starting line during the inaugural Rock the Monument Four Miler Run/Walk held June 12 at Melvin Miller Park in Urbana. 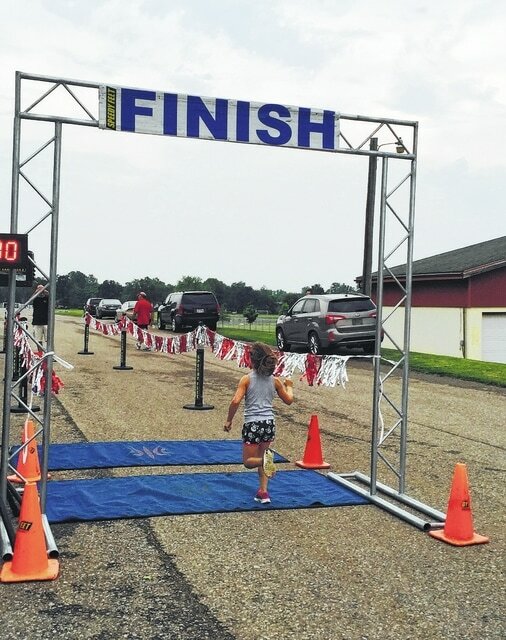 Madilyn Long, 7, of Urbana, crosses the finish line during the Rock the Monument Four Miler Run/Walk held June 12 at Melvin Miller Park in Urbana. Competing in her first-ever 4-mile race, Long finished in a time of 54:49.3. Over 60 participants turned out for the Monument Square District’s inaugural Rock the Monument Four Miler Run/Walk and 1.5-mile Fun Walk fundraiser held June 12 at Melvin Miller Park in Urbana. While fewer than 10 people took part in the 1.5-mile fun walk, 60 individuals turned out to compete in the 4-mile run/walk. “Speedy Feet (provided race services) said it may have been a small group, but the atmosphere was great, and they enjoyed doing this event,” Deere-Bunnell said. The fundraiser helped MSD raise $890, which will be used to support downtown projects. Plans are for the Rock the Monument Four Miler Run/Walk to returnt, possibly on June 10, 2016, Deere-Bunnell said. Edward Mussi, 21, of Saline, Michigan, turned in the fastest 4-mile time of 27:20.6. Sandy Hoening, 56, of Burkettsville, was the first female to cross the finish line in a time of 32:11.4. Finishing first in their respective age divisions on the male side were Mason MacGillivray (12 and under) in a time of 33:55.7, Keane Dunn (13-18) in a time of 30:26.2, Ryan Ropp (19-25) in a time of 40:52.7, Eric Warrick (26-35) in a time of 29:02.2, Andrew Wells (36-45) in a time of 33:27.7, Mike Dickerson (46-55) in a time of 28:34.7 and Philip Hisnay (56-65) in a time of 35:16.7. Placing first in their respective age divisions on the female side were Abigail Wells (12 and under) in a time of 34:48.9, Christina Anderson (13-18) in a time of 43:12.3, Erin Hoening (19-25) in a time of 34:11.7, Tracy Anderson (26-35) in a time of 35:32.2, Joy Britton (36-45) in a time of 35:23.2, Lisa Blake (46-55) in a time of 37:40.7 and Carol Souza (56-65) in a time of 34:20.6.